Time travel is a tricky business—so tricky, in fact, that the danger of messing with time serves as the subject of virtually every notable time-travel tale since Ray Bradbury wrote the 1952 short story “A Sound Of Thunder.” In that tale, a traveler to the past determined to hunt down a T-Rex strays from a carefully laid-out trail and crushes a butterfly, creating a ripple of temporal change that becomes a mighty wave over the years, changing history in ways no one thought imaginable. Terminator Genisys series pays lip service to the consequences of dipping into the timestream, then jumps in head-first, crushing more than butterflies in the process. But in this fifth installment of the increasingly loosely related Terminator series—it essentially uses time travel as an excuse to loop the third and fourth films out of its continuity—the time travel is more convoluted than thought-provoking. The crushing isn’t particularly fun, either. The film opens as John Connor (Jason Clarke) has started to draw his post-apocalyptic war with the forces of Skynet and the kill-happy Terminators to a close. John fights alongside Kyle Reese (Jai Courtney, blandly stepping in for Michael Biehn), whom John knows is fated to father him in the past. But their greatest moment of victory turns into their greatest defeat when they realize Skynet has successfully sent a T-800 (a computer-simulated Arnold Schwarzenegger) back to 1984 to kill John’s mother Sarah (Emilia Clarke, subbing in for Linda Hamilton). So far, so familiar, and though the film’s opening gets bogged down in exposition and the clash of CGI machines, director Alan Taylor has fun letting the action of his film overlap with the look and action of James Cameron’s 1984 original, and diverge from it. Expecting a meek, helpless Sarah, Reese instead encounters a tough, battle-ready woman who’s been preparing for his arrival, and for fighting Terminators, since she was rescued and raised by a T-800 she calls “Pops” (Schwarzenegger, in the flesh). That’s a potentially clever setup for the movie, and what fun there is to be had with Terminator Genisys comes from watching Pops and Sarah interact. After a half-assed explanation about why he now looks deep into middle age—Terminators’ human skin ages just like it would on a human body, now stop asking questions—Schwarzenegger settles into playing the big robot as a cranky old man, repeatedly stating he’s “old, but not obsolete.” There’s a hint of autobiography to that monotone insistence, and Schwarzenegger proves it by being one of the few elements that keep Terminator Genisys interesting. He’s somehow both imposing and wry, the killing machine as sitcom dad. Unfortunately, he isn’t the whole movie. The setpieces, in addition to mostly rehashing better scenes from earlier films, feel thrown together to serve the effects, and the effects look far less astonishing than anything in Cameron’s first two films. It’s telling when the big Terminator software upgrade—a bad guy made up of tiny magnetic microprocessors—appears less impressive and frightening than the T-1000, the liquid-metal baddie introduced in 1991’s Terminator 2: Judgment Day. Or that when the T-1000 makes a return appearance, Genisys mostly makes it do what it did the first time around. The film almost completely falls apart in a second half in which Reese and Sarah have to run through 2017 San Francisco to stop the launch of Genisys, an operating system designed to link everyone’s information and devices to a single, powerful system. (In a line that typifies Laeta Kalogridis and Patrick Lussier’s clunker-filled script, one character refers to it as “the ultimate killer app.” Heh.) Terminator Genisys then becomes as loud as it is tedious, and cutesy touches like J.K. Simmons’ essentially pointless appearance as a drunk cop who believes in time travel don’t help. A montage in which Sarah, Reese, and Pops get arrested, set to Inner Circle’s “Bad Boys,” made famous as the theme to Cops, plays like the series finding its nadir. Or, more accurately, the nadir of the nadir. 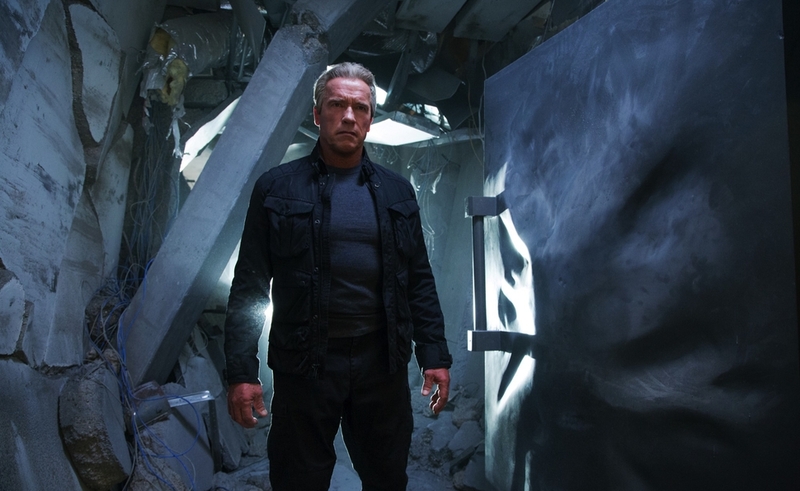 Unavoidably, Genisys has Schwarzenegger’s T-800 promise “I’ll be back.” Fine. But it’s probably time to shut down the lurching, brainless machine this franchise has become.